Minimum Age Requirement is 16 Years. Season runs from October to February and we only hunt Monday and Friday. This full day experience is the perfect gift for those that enjoy the thrill of the hunt. Being greeted on arrival and taken for tea or coffee, this is where you are introduced to your falconer for the day and he takes you through a brief safety talk. It’s then off to meet the birds that will be your feathered friends for the day. 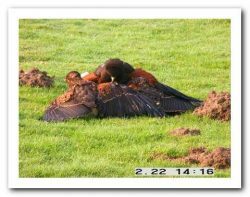 This will be either a Harris Hawk(s) or a Red Tailed Hawk both of which can be awesome to watch as they chase their prey. Your falconer will then give basic instructions on how to handle the bird and how to entice it back to the glove. The Raptor Foundation will then use one of the many areas of private land that we use for hunting and this is where the fun begins. The bird(s) will be launched into the nearest tree and will immediately initiate the search for prey. 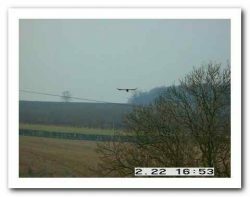 You then watch the hawks do what comes naturally as they follow you and the falconer around the local countryside. Although we don’t always catch something, the chase is often more exciting. You return to base for lunch and a chance to discuss the mornings hunting before setting off for an afternoon of thrills and excitement. At the end of your experience you will have a photograph taken of you and your hunting companion as a memento of the day. We recommend that you wear suitable clothing dependent on the weather and time of year. Long trousers are best as there are many brambles and stinging nettles along the paths that we walk. Jeans are probably best but any comfortable walking trousers will do. On your feet we recommend wellies or walking boots, trainers will do but just remember if it has been raining it can get very muddy. 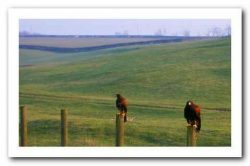 A walk in the countryside with a bird of prey is a thrilling and breath taking experience. If you suffer from any conditions or illnesses that may affect your walk please let us know in advance. 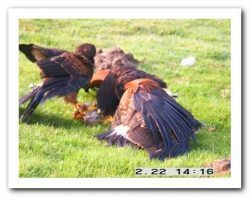 If you continue with the walk and an incident occurs the Raptor Foundation will not accept responsibility for the incident. Hunting Days are not suitable for wheel chair users although we can offer alternative experiences such as Meet The Birds and Falconry Experience Day. 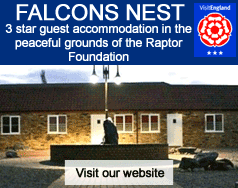 All experience days must be taken on day booked unless due to exceptional circumstances or cancelled by the Raptor Foundation due to bad weather. Price: £80 (All of our experience days are on a one to one with a trained falconer and one free guest can accompany you) Gift vouchers available. © 2019 Copyright The Raptor Foundation. Web design by	SplashPixels.